I planned to spend 3 days in Baltimore, I wish it had been longer. I was excited to visit the city of The Wire we got the train from New York City to Baltimore as we arrived into Baltimore through the North of the City it looked worse than Flint or Detroit, burnt out houses, graffiti over everything, rubbish flying around and empty streets apart from the odd beaten up car. The other reason that there was a level of anticipation for our trip was that there had been riots over the city the same week of our arrival, that sounded and felt very similar to the London riots in 2011. We met Revd. Jim Hamilton of Church on the Square at the station and he drove us through Baltimore to the central east side which is where his house is and church also. As we drove through he streets we saw the Projects where The Wire was filmed and the central office buildings – it was slightly weird but also slightly exciting. 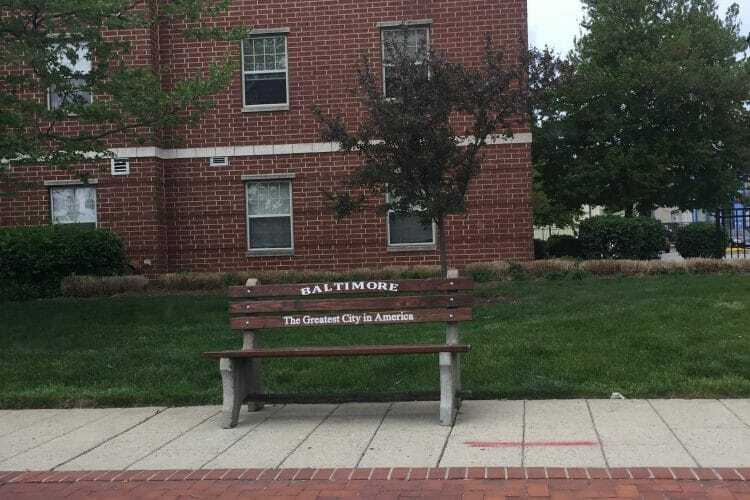 Small town: Several people said to me that Baltimore is a city that has a small town mentality, and I can certainly relate to that in my experience. As I walked the neighborhood with Jim people stopped waved and chatted (I partly think this is down to Jim’s charisma but not exclusively). The deeper thought I had was whether it felt like that because it is a deeply divided community, with the African American community separated from the White American community, small towns living next to each other. There are people that talk and there are people that do: As Jim has co-Pastor John and I boarded up windows of shops that had been looted in the riots, we were watched by a large crew of reports and ‘officials’ (I think they were from the Mayors office). It felt strangely awkward that there were far more people talking about what the few of us were doing. It sort of compounded the feeling of ‘us’ and ‘them’: distance and separation. This is some of the division and difference that some have argued formed the basis of the riots. In difference and division issues of racism, poverty and injustice are all the more visible and painful. How to make a difference: We sat with a church as their collective heart was aching and breaking for the lost of a young life and the brokenness of their city, it was a privilege to hear their thoughts on how they might change the situation. My first reflection is it is often hard to think about what the solutions are in the mist of the action, pain or hurt; we need time to process and measure. Second, a true compassion is at first hurting with those that are hurting. For example: ‘Jesus wept’ (John 11:35) – Jesus with Mary and Martha is just one example of Jesus’ compassion. Thirdly, it’s important to carefully think about what our response is and who it is for. It is easy to respond to these situations in a way which is more about us than about the community or others around us, especially as youth workers with saviour complexes! It has taken me a long time to think about and write this blog, Baltimore is a strange, beautiful and intriguing City and one I hope to revisit. Well that’s the US trip over, I hope you have found the reflections helpful or interesting.